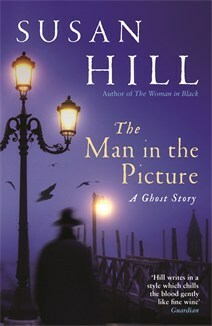 The Man in the Picture, by Susan Hill, is a very enjoyable read on a dark winter's evening. It has echoes of earlier English ghost stories, some of which can't quite be grasped. The setting and feel created is reminiscent of M.R. James and Daphne du Maurier. The story is set in College rooms (although the university here is Cambridge, rather than M.R. James's Oxford) as well as London, and also an old country house in a remote part of the North. We have one of M.R. James's favourite devices - a story narrated by one character to another; a story within a story. We have events which are reported to have taken place in the distant past. We have rumour and suspicion. We have suspense created by breaks in the story as "real life" interferes. But most of all we have atmosphere. As the author herself says,"What makes a good ghost story? Atmosphere. How do you create atmosphere? By working yourself into it imaginatively until you are there - you can see, hear, sense and even smell your atmosphere. "Have you read "The Picture of Dorian Gray"? Have you ever been in a room where you feel the eyes of a person in a portrait follow you round the room? Well those sinister sorts of feelings are conjured up by this novel, and one of the characters is straight out of a gothic romance. It is a chilling and horrific story of revenge.As the title suggests, this is a tale of a painting, and one of the people it it. The painting is a complex and detailed view of Venice at Carnival time, when the people wear masks. The masks are intended to disguise people's identity, but this story develops into a haunting spine-chiller. The reader learns of the painting's history, and its future, its transmogrification, and why it becomes the most important thing in the life of anyone who owns it. There are few new ideas in this story, but the whole is very satisfactorily woven together. Susan Hill is an English author of fiction, short stories and some factual books. She achieved literary success at an early age, publishing her first novel at 19, whilst in her first year at university. Her books cover a wide range of themes, and four have won major literary awards. She also writes the very popular "Simon Serrailler" series of crime novels. She has always had a leaning towards the gothic, and in 1983 wrote "The Woman in Black". Latterly she has also taken to writing an annual Christmas ghost story; this one is from 2007. These very accomplished novellas are also more geared toward the popular market, as she says, "I love writing ghost stories, though I confess I don't take them too seriously, and I love reading them, too. I have learnt that there's no room for padding, for no superfluous words. Less is always more. ""I like to work my way gradually to the frightening heart of a ghost story, lull the reader into a sense of security before letting them become aware of the screw and, a little later, beginning to turn it." I picked up this little gem of a novella about 2 years ago- for the ridiculous price of $16.50 (if you ever see how small it is you will get just how ridiculous that is)...but it was just so beautiful I couldn't seem to walk away from it. I eventually brought it home, and every so often I would pick it up, and then put it down- thinking- "no, it's not the right time." This is one of those books that begs to be read on a dark stormy night by the fire...[image error]On a cold winter's night, Oliver visits his old Cambridge college professor- Theo Parmitter. Theo has a secret he needs to tell. The secret involves a painting that Parmitter acquired when he was a young man. The painting of a Venetian carnival by an unknown artist, that seems to have the power to destroy those who cross its path. [image error]THE MAN IN THE PICTURE is very short- only 145 pages. A perfect, creepy and atmospheric little ghost story for this time of year. As a long ago student of Professor Theo Parmitter, Oliver had taken to visiting his old friend in his apartment at Cambridge whenever he was in town. On this particular visit, Theo decided he wanted to tell Oliver the story of the old Venetian painting which was on his wall and had been in his possession for decades. The painting was an eerie and mysterious vision of revellers at a carnival, many of them wearing masks. The story Theo told and the events which had occurred caused profound unease in Oliver…but worse was to come.Unease and a deep sense of foreboding travelled through each and every person who had a story to tell about the Venetian painting – there was a power attached to it; an evil presence…I don’t read horror as a rule, but needed one for a challenge I was doing. So when I discovered The Man in the Picture buried deep in the recesses of books forgotten, and knowing I’d read a Susan Hill before, I thought it would be perfect for the category needed. And it was! Creepy, eerie and sinister – author Susan Hill knows how to make her readers shudder. Recommended for fans of horror and the paranormal. The Man in the Picture is a short story which was somehow published as a separate book. Even shorter than The Woman in Black, the story - although well written - is similarly unoriginal and largely forgettable.The picture in question is described by the main narrator, Oliver, who himself retells a story told to him by his former university tutor. The tutor is fascinated and frightened by an oil painting from his collection: in its depiction of a Venetian carnival scene, he notices a barely noticeable man observing the festivities with horror and shock, apparently against his will. From Oliver's retelling we learn how the painting came into the tutor's possession, and how he afterwards met an elderly countess who wished to obtain it for her own collection; the tutor is unwilling to relinquish it, wishing to learn the identity of the man in the picture - and both he and Oliver will learn more than they both bargained for.This is a story which could be told around a campfire, or in a cold winter common room at a English university decades ago, when there was no radio or television, and even books weren't as available as they are now. A seasoned teller could properly build up the atmosphere and sustain tension and dread all the way to the very end, when the listeners would depart and find themselves unable to sleep in their cold, creaking beds. This isn't the case here, as the story itself resembles more the bare bones of a greater effort than the effort itself. A foundation was laid, but the mansion remains unfinished - which is a shame. Susan Hill has all the potential and ability to write ghost stories in the classical way, but her writing needs more innovation and less inspiration to unnerve and chill this reader. Wonderful, scary, horrendously sinister and chilled me to the bone. After the supreme disappointment I had whilst reading 'The small hand' I think Susan Hill returns to, if not quite the top of her game that she reached in 'The woman in black', then certainly pootling around just below the summit.This story is short and swift moving. Hints and nudges in the direction of something of horror lurking in the shadows is cleverly built up. A picture, which is I suppose a common device in ghost stories dominates as gradually character after character falls victim to its horrifying power. Indeed the whole reminded me of a number of the stories of MR James though this is not in anyway to take away from the brilliance of Hill's creation.The picture brings a dreadful oppressive atmosphere to the whole story and its ability to some how imprison people within its very oil, to have the image change as each is taken, is horrible. And that horror lasts well after the denouement. If you are looking for a ghost story to unnerve and unsettle and then build up to shivering and shaking, then this is definitely it. Though I would warn you, you might take to throwing out surreptitious and worried glances at that oil painting which your granny left you and you are now not so sure about. Definitely a Goodread. This was excellent, much more than the 3 star would imply. It's 3.5 stars. The reason I didn't go for 4, was because of the ending. Up until that portion of the last 3 pages, it was fully 4 stars. Why? Because of the mood it set and the depth of the creepiness. The descriptive language and sinuous twisting grasp of malice that just entwined. Not only you, the reader, either. For some reason the length of this novella heightened the effect, did not lessen it. It's a one sitting goose bumps and hair rising on your neck interlude. In fact, much later I had it pop into my head and that heaviness of dread returned immediately. Exactly as if you were being watched, knew it- and still have full cognition that it could not be true at the same time.Slight spoiler ahead- but it certainly changes little of the plot. What failed for me was that it became beyond macabre and into ridiculous when the final wife, Anne, wanted a Venetian honeymoon (after the new husband's hearing of the former long history and what he has witnessed). Come on! Pulls of the super normal or spell of the painting, those non-withstanding! Her husband would have opted for Paris and ditched the painting back to the old lady as soon as his old college prof.'s corpse was cold. The damn thing was laying on the floor anyway- who would have known? He would not have caved into a Venice for the gift of three separate country estates. That kind of malice, depicted in this tale, does exist. Anger turned both inward and outward like a toddler who will hold its breath and pass out, when not getting his /her way in tantrum, as long as the agony of noise and chaos of continued curse spreads. Revenge and that angry outrage of "dissatisfaction" is poison, both to self and to others. When the poison is spread so widely, as in this story? Horror. Susan Hill could write -truly fixate that mood and malicious intent. Sublimely. I bought this on a whim and read it in one sitting, thinking it would be just the thing for a Sunday night while tucked up in bed. I really enjoyed it, but am in two minds about how to rate it. On one hand, it was exactly the sort of thing I love - an atmospheric, compelling ghost story with plenty of deliciously chilling details. The chief narrator, known only as Oliver, recounts a strange tale told to him by a former university tutor. It concerns an oil painting in the tutor's possession - depicting a carnival scene in Venice - which appears to have a haunting, even hypnotic power. The titular man in the picture is a particularly noticeable figure, apparently an unwilling participant in the festivities, staring out from the scene with an expression of horror and despair. Via the tutor's memories of his meeting with an elderly countess, we learn who this man is (or appears to be) and the truth of the picture's terrible secret. The tutor's story isn't told all in one go - which is a effective device, as it allows for a break in which Oliver, seriously spooked, returns to his own lodgings and finds himself in the grip of terror. This was my favourite scene in the story and really helped to create an atmosphere of mounting pressure and suspense.But, on the other hand... I can understand this originally being released as a self-contained miniature book (apparently it was first published at Halloween) but I did nevertheless expect it to have more substance. I only paid a few pounds for it, but then, you can buy sizeable novels for Kindle at the same kind of price. As with The Woman in Black, I found myself wishing I could buy a compilation of Hill's ghost stories instead. The problem with reading what is essentially a short story in isolation is that after finishing, I began to feel unsatisfied and to question things about the plot, whereas had it been part of a collection, I don't think these thoughts would have occurred to me. There's no explanation of how the picture comes to acquire its power, what happens to those who are consumed by it or - crucially - how the mysterious Clarissa develops the ability to extract her revenge through it. I was hoping to be left unnerved by the tale but it didn't feel complete, and could have been fleshed out so much more. A man visits his old professor at Cambridge, who tells him the strange story of a painting he owns. The book's narration becomes a story within a story within a story. The pace slowly builds, adding a feeling of dread throughout the plot. Fans of M. R. James and Algernon Blackwood will enjoy this weird tale. The writing style really makes me think of those two authors. An enjoyable old-fashioned horror story. This is a small book, and a quick read. The story is fairly enjoyable, though I did not find it scary.I read the hardcover, which is physically small, while the cover's image conveys the sense of something dark and heavy.This felt like a Victorian novel, from its language to the dark, broody imagery and to the evil portrait. I felt like much of the story took place at night, in dark rooms, gothic locations. 3 1/2 stars.A fine little ghost story! Just the right thing to read on a dark, snowed-in afternoon. this was mediocre at best. It was a good idea, that of a picture that trapped people in itself but the internal logic was feeble and none of the characters ever came to life. OK, so the story is that a spurned woman uses this picture to take revenge on the man who would have married her and the woman he preferred. There is absolutely no explanation of how she obtained this picture or managed to interact with it to strike at, not only the original couple, but a later couple who have absolutely no connection with the original situation. She is supposedly just another upper-class young English girl, albeit wealthy and very beautiful, and this kind of operation isn't generally covered at the usual ladies academy. There is not even an effort to explain her access by means of exotic background, mysterious relative, or even any personal interest in archane and occult matters. The picture just arrives and the new wife feels forboding. Not only that, we are supposed to believe that this same woman is so beautiful that she managed to seduce the son of the original couple twenty years later. not so much.The story tries very hard to be ominous, but just managed to just be bleak-ish. An ok ghost/gothic story read in one sitting. Not in the same claas as The Woman in Blackbut easy to read with a few nice twists. The story basically involves an eighteenth century painting of Venice; a masque taking place by the Grand Canal with lots of figures in the picture, masked and unmasked. The basis of the story is that here in the twentieth century people end up in the picture and can be seen with a look of horror on their faces. It's all good spooky stuff. Oddly this is the second book this year I've read about a person ending up in a picture. Wilson Harris's The Ghost of Memoryis a reflection on the death of Jean Charles de Menezes, the Brazilian shot on the tube in the aftermath of 7/7. That is magic realism rather than gothic horror. A strange coincidence I think. Yes, this is a shameless plug for Wilson Harris who is (in my opinion) very much underrated. This one pretty much does what it says on the tin and Hill writes in a way that draws you in; bit like the picture! The Man In The Picture is another little gem in the collection of short novels bySusan Hill, written in the ghost/horror genre. This tells the story of Oliver, who, when visiting his old tutor, Theo Parmitter, hears the chilling tale behind the acquisition and possession of a painting. This painting depicts a carnival scene in Venice, but it is a very special painting, as Oliver learns, to his cost.I enjoyed the style adopted by the author for the telling of this story. She seems to have stepped straight into the tradition of a previous generation of authors of ghost stories - nothing sensational, but slowly building the tension and sense of foreboding as the plot unfolded. The writing was deceptively simple - easy to read, but with few words, Susan Hill depicted scenes and emotions vividly, creating a chilling and atmospheric novel. I enjoyed this little ghost story. The Man in the Picture is a quick read. You can complete it in one or two sessions. I think it is best read on a stormy winter night in front of the fireplace with a glass of merlot in your hand. The first thing that came to mind when reading this story was "Twilight Zone". This is exactly the type of story that terrified me as a child while watching the famed TV show. As an adult, the story was not terrifying but the story definitely held my attention. The story centers around an oil painting. A Cambridge professor tells the story of the painting's history to his friend and former student. The painting has a dark history and tragedy follows its owner. Of course, the painting ends up in the hands of the friend.I think the story would have been a bit more captivating if it wasn't so short. It was really too long for a short story but too short for a novel. I think the story ended rather abruptly. All said, the story was fine for a quick read. I think an expanded version would be more satisfying. I'll admit that this one confused me a little which made me zone in and out every so often, so that would have affected my enjoyment. This was a short creepy read, quite original and well written but I didn't enjoy it as much as I did 'The Woman in Black'. I like a good scare but this just didn't give me the scare I was hoping for, no goosebumps and the story became too predictable towards the end. Perhaps due to it's short length it came across a little flat, however, considering how short it was it was an ok read. Short, sweet, spooky...if you love Venice, you'll never look at it the same again. Unless, of course, Venice previously struck you as devilish and diabolical, in which case, you'll feel right at home.Great momentum, appropriately brief--reminds me of the rhythm from some of the best HP Lovecraft short stories. 2.5 stars - it was very "meh".Nothing special, nothing scary, no memorable characters. It wasn't necessarily bad, just very bland. Don't think the style helped either. I thought I was a sucker for ghost stories, but it seems I've changed a bit since high school. I wonder how I would perceive The Ghost Stories of M.R. James if I were to read them again at this age. Or better let them untouched on the pedestal built from my childhood memories.Maybe The Man in the Picture was not so good a story after all. The first part was captivating, I almost felt some shivers down my spine. But the second part, with the unfolding of the mystery behind the XVIII century painting, was almost dumb. In fact, it was getting dumber and dumber, so the twist at the end made me laugh out loud instead of getting chills through my body.Definitely a read for middle-graders, at least they still have the chance for a good fright. This is a short book hence why its gone straight in as being read. its only 142 pages long but its an enthralling read and one i totally enjoyed (I enjoyed it even more picking it up from a local charity shop). The story is basically told in the style of a classic ghost story where the build up and impending dread is far or effective and tangible than any slasher or vulgar use of supernatural means. This story is penned by the creator of the Woman in black and the same elegance and fluid use of words is visible here. A great read - perfect in length and both subtle and concise in its delivery. The only thing missing is a howling storm. I read this story in an afternoon; it's short, 145 pages. I love Susan Hill so I already had a positive feeling going into it. And it delivered. I will say the ending was a bit predictable, but Hill put a twist on it so it worked quite well. It was not so much scary as it was haunting, ghostly, and nostalgic ... everything you'd expect from Susan Hill. A very short ghost story that was fairly interesting but not 'nail biting' in any way. I found the writing to be bland, the characters flat and, well, it seemed as though the author was bored with the material, thus I was too. This book was not at all what I expected. I got it from a mail-order book club, and it's a very small hardcover with less than 150 pages. It wasn't scary at all....it reminded me of an old episode of The Twilight Zone. Fantastic ghost story featuring a creepy painting, a woman scorned, and lots of unfortunate victims. It's a short, fast read. Here's how I know for a fact it was a great ghost story: I had to check under my bed for spooks, goblins, etc. while I was reading it. This book had that gothic feel that I enjoy so much, very atmospheric, however something was lacking and so many questions left unanswered. I loved The Woman in Black by the same author so will definitely give another book of hers a try. I've read a fair few Susan Hill books now, and I have to say that as with a couple of the others, I finished this one feeling like it would have worked considerably better as a short story. The concept and settings are great, and definitely lend themselves to a creepy little tale, but the ending is so predictable from the offset that reading 150 pages to get there ends up feeling somewhat formulaic and underwhelming.This stretching out of what should have been a fairly simple, brief story could perhaps have worked if the writing itself was lyrical and transporting, or the characters deeply developed, but I find Hill's style very straight-forward and free of any bells and whistles, meaning that for me, it's unable to sustain or justify the extra time within the story.That said, it was an easy enough read for the Halloween season; it did have its merits, as I mentioned; and I added an extra half star on for a great final line. A Good book to snuggle up with on a cold night. I really liked it. Supernatural kind of Freaky. This is the kind of book I look forward to in fall. a simple short story but effective, i enjoyed it! This review is also on my blog: www.bookblogbird.weebly.com.Woop woop! Book Club Alert!A couple of years back, a friend of mine started up a book club. She had noticed that Amazon’s algorithms - the ones where they flash up ‘because you bought books A, B and C, you might also like books X, Y and Z’ - were funnelling her down such a narrow path that she was soon going to be in danger of reading the same book over and over for the rest of her life. Hence, the book club. The idea is that once a month we all read something that a huge corporation hasn’t pre-decided for us, like in some weird, literary future dystopia (hmm, good idea for a book...).So this month, someone decided on The Man in the Picture by Susan Hill. I don’t really do horror books. At all. I figure there are enough scary things in the world without being additionally terrified by the book I’m reading.The Man in the Picture is narrated by Oliver, a Cambridge alumni who returns to his old college to see a tutor of his who is elderly and in ill health. The scene is set nice and creepily on a cold January evening with the fire roaring in the hearth and Oliver’s tutor starts to tell the story of a painting he has in his possession, a Venetian carnival scene. When Oliver inspects the picture closely, he notices some out of place characters. He thinks this is odd, but as his tutor recounts the history of the painting, Oliver realises the strangest part is yet to come...The Man in the Picture was okay. Only okay. The writing was good and the plot was creepy enough to spooky me out, but not so creepy that I lost sleep. The problem I had with it was all the unanswered questions I had at the end. Who was the man illuminated in Theo’s window? If the woman in white was the jilted fiancée, then how was it she was in Venice when she was supposed to have died decades ago? Was she a ghost? Possessed by a demon? Why did the woman in white target Oliver instead of Theo? It felt like the book finished too quickly. Maybe it was the author’s intention to keep us guessing and frustrate us with unsolved clues, but it actually ended up annoying me.Susan Hill also wrote The Woman in Black, and I’d be tempted to give it a go purely based on the strength of her writing, but unfortunately the plot holes in the Man in the Picture were too much for me to ignore.